New Delhi:(Page3 News Network)-National level NSCI Safety Awards, 2011 for organisations in manufacturing, construction and MSME sectors were today presented by the Minister of State for Labour and Employment, Govt. of India, Shri Kodikunnil Suresh here at the NSCI Safety Awards Function held in the Auditorium of Scope Convention Centre, New Delhi. Speaking on the occasion Shri Suresh lauded the role of National Safety Council (NSC) for maintaining and implementing effective occupational safety & health management systems. by Shri Ravi Mathur, IAS, Additional Secretary, Ministry of Labour and Employment, Govt. of India was also present on the occasion. National Safety Council (NSC), an autonomous organisation in the field of Occupational Safety and Health, set up by the MOL&E, has been operating the awards scheme since 1998. These Awards are given to recognize factories, construction sites and MSMEs for establishing and implementing effective occupational safety & health management systems and achieving outstanding performance during the assessment period. The assessment period for the Award year 2011 for the organisations in manufacturing & MSME sectors was three years, from 2008 to 2010 and for construction establishments one year – 2010. The Awards committee, through rigorous assessment criteria has adjudged 61 organizations for four levels of awards from 269 entries. In manufacturing sector, the 1st level award, Sarva Shreshtha Suraksha Puraskar, which carries a Golden Trophy and Certificate is won by the Kakrapar Atomic Power Station of Nuclear Power Corporation Ltd. located at Anumala, Tapi, Gujarat under Group C of the awards scheme covering Power Generation – Thermal/Hydel/Nuclear Power Plants of the awards scheme. The construction division of Lanco Infratech Ltd, Pathadih, Korba, Chhatisgarh has bagged the Sarva Shreshtha Suraksha Puraskar in the construction sector for their project – Lanco Amarkantak Power Ltd; Unit 3 & 4. In MSME sector Nobel Synthetics Pvt. 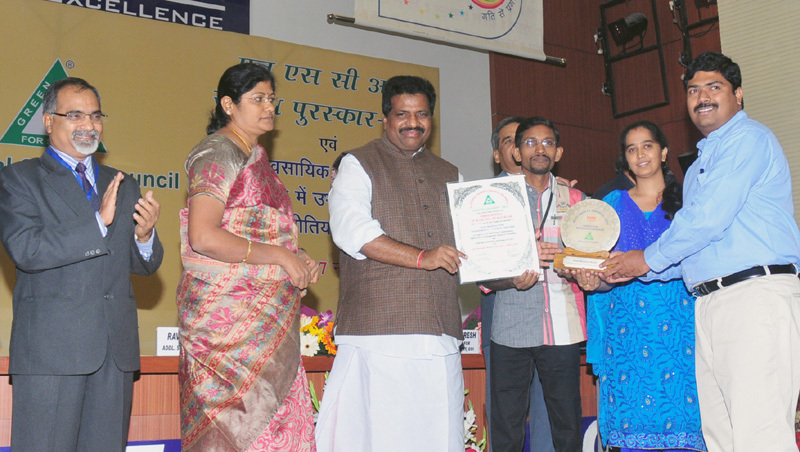 Ltd, Navi Mumbai is the winner of the Sarva Shreshtha Suraksha Puraskar.